When I signed up for this race, which is my 21st time here I believe, I had two goals in mind. One was to beat my time of 83:07 from 2016 and two, to move up from 4th in age group to at least 3rd for a podium finish. Well, neither of these were achieved so you might think I was feeling let down and not pleased with the results afterwards but actually I'm feeling pretty good about things right now. My time was 2 minutes slower but somehow I still finished 4th in the AG. It would have taken an 82:32 to place 3rd. Just as a quick side note all three ahead of me are from the Lynchburg area. So. you may be asking why I'm happy with it. 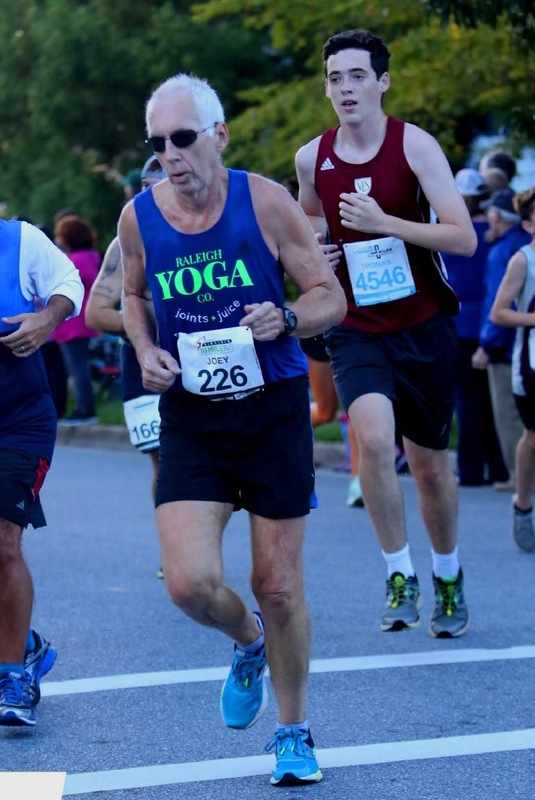 Of course I would like to have done as well as originally planned but as you may or may not have noticed my run training has fallen way off since completing the Grand Prix Series that ended on Memorial Day. I can think of several reasons, ie excuses, mainly a miserable summer but bottom line is I just didn't do what I needed to do to make the run a priority and as race day approached it was obvious I would not be close to beating the time from 2016. As the week rolled by I was really looking at a most miserable race ahead and wouldn't have been surprised to fall apart and struggle even if I approached it as a training run. But I chose to be a bit more optimistic and with a bit of favorable weather, and a sensible pacing plan that I may be able to run 85:00. Well something worked and I ran 85:10, felt good the whole race and I didn't need a walk break on the last climb which gains about 200ft in 1.5 miles. There are several things that I believe helped with what I consider a successful run today. It was a bit cooler than last year but still very humid but I never felt overheated even though it was around 70 and sunny when I was done. (totally drenched). I did run a sensible pace and all my splits were pretty consistent when you factor in the extreme changes in the elevation profile. I seemed to have lost most of the 2 minutes between miles 2 and 8. I was actually about the same for the last two miles ! I think I also got a bit of an endurance boost from the Marathon five weeks ago. 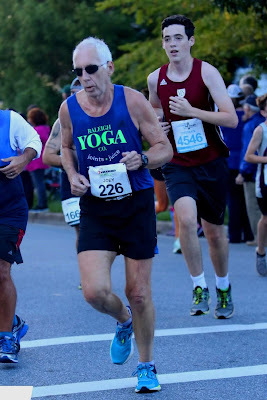 And lastly I'm pretty sure that the fitness classes I've been doing 2 or 3 times a week, the Grind And Unwind 30/30 at Raleigh Yoga Company helped get me up the hills in good shape. Lately I've not felt as strong as normal on the limited hill training I've been doing but in the class we have been getting a steady diet of lunges, squats and calf raises as well as some good cardio with the HIIT portion. Without it I'm sure I would have had to take a few walk breaks that last mile instead of holding steady. And I was up on my toes on the steepest hill at mile 5 that is like the steepest on North Turkey Creek! Along here is where you start to see the elites as they are coming back at the 6 mile mark. They beat me to it this year ! Just past mile 4 I saw local friend and Grandmasters ace, Tim Meigs looking strong and probably in the top 20 overall ! Soon after I saw all the ladies from Raleigh Distance Project going by. I gave a shout out to Rita who I've known since she was still in High School ! Started the loop around Riverside Park and was dreading the super steep hill at mile 5. I pushed it a bit on the downhill before and then began the climb. Wow, I actually felt good and up on the toes. Tons of volunteers really cheering people up. Hit 5 in 8:21. That was a confidence boost. Mile 6 was 8:28. Just before mile 7 is a fairly steep hill but not too long. For the first time my legs were beginning to feel a bit dead and in the back of my mind I was thinking that could spell disaster at the end. I'd done the math and 85 was possible but not if I blew up on that last climb. Mile 7 was 8:33. I quickly recovered and was back up to pace running strong in mile 8 which is one of the easier ones other than a hill up to the mile marker, Hit that in 8:22. The 85 was in the bag now if I could hold it together. As always I tried to push as hard as I could down the steep half mile before the beginning of the climb but also trying not to beat the legs up too bad. And then the long grind began. The half mile up to the is the worst of it, probably a bit steeper than powerline in Umstead. But I was moving steady and made it to the mark in 9:20. Woohoo ! One more to go ! The steep part continues for a bit longer and then it eases of to just a normal hill lol. With half mile to go it gets a bit steeper again but even though I was tired and feeling it I never felt the need to walk. You get a short slight downhill and then a slight uphill for the final 200yrds to the finish. I tried to push it hoping to crack the 85 minute barrier but ran out of real estate but 85:10 was close enough for today. Call me crazy but I think I still have a sub 80 in me for this race or at least close to it. It won't happen unless I continue to stay healthy and get my weekly mileage back up to the 45-50 miles per week range again for an extended period. It's a full year away but I'm pretty sure you can plan on seeing me back in Lynchburg at least one more time. And for the immediate future, this was a big confidence boost that I can do some decent training and racing soon. I feel good and with cooler temperatures coming now I'm getting motivated to make the run a priority again. New England Green River Marathon.